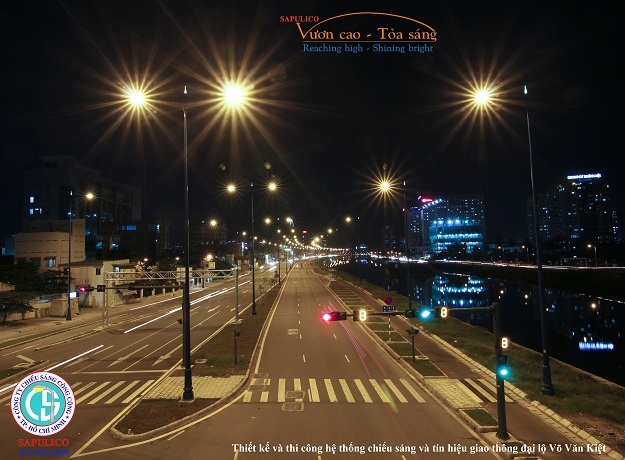 Public lighting in Sai Gon East-West Highway has total length 21,8km, the beginning is intersection with the 1A highway (Binh Chanh District) and the end of the Hanoi highway (District 2). Highway passing through districts 1, 2, 4, 5, 6, 8, Binh Tan and Binh Chanh district, of which 1,49 km tunnel crossing Saigon river. The East-West Highway is the new urban roads and function as the main road to Hanoi Highway, as well as forming part of the ring road in the south. At the same time this is also the major transport works and most modern in Ho Chi Minh City. On the East - West Highway from the 1A Highway to the Lo Gom bridge (District 6) design with 10 lanes, from Lo Gom Bridge to Ben Chuong Duong Street (District 1) has six lanes and is designed for vehicles 80km/gio flow rate. The Saigon East - West Highway project has a total budget of investment 660,66 million USD, accounting for 64.82% Japanese ODA capital and reciprocal capital accounted for 35.18% of the country. Employer is Ho Chi Minh City People's Committee. Construction work began in April-2005 and estimated time to complete the whole project in Octorber-2010. 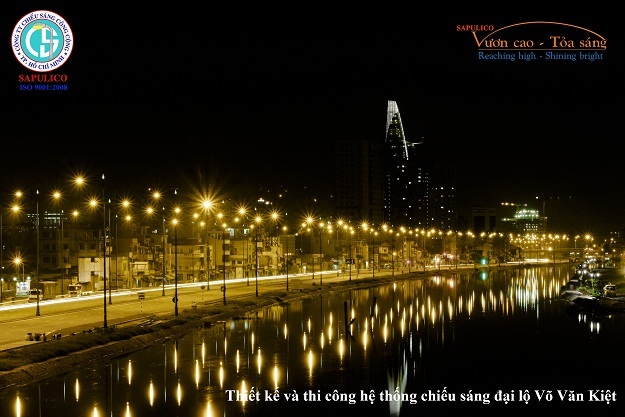 The Ho Chi Minh City Public Lighting Company Limited responsible for constructing the public lighting, traffic signal system and Closed-circuit Television (CCTV) for the entire package as well as connected to the Control traffic signal and CCTV Center for the whole East-West Highway project. 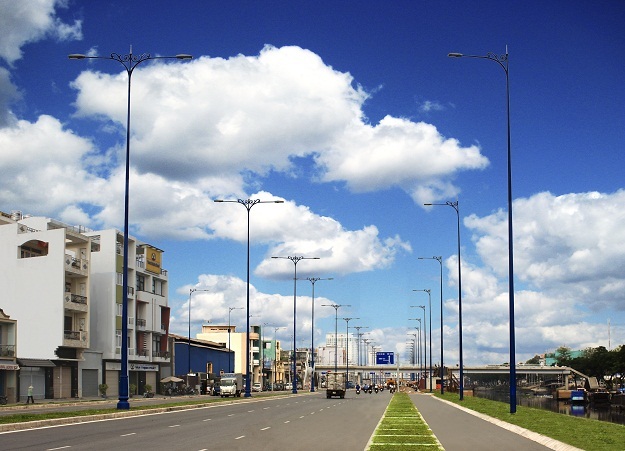 Public lighting system in the East - West Highway package 1 - the road along channel which The Ho Chi Minh City Public Lighting Company Limited constructs includes 3 lanes are installed symmetrically through centre line. Head lights 17,5m are painted blue like the shirt fabric panels blend harmoniously into the deep blue of the sky, feet of head lights are created seems very full of ancient elegance with a cast iron base and top of head carved pattern was crowned by a lamp 3W power tower full of charm in the wind. Hoa Binh Market sector (District 5) using 23 head lights 11m are attached two stage 250W/150W power supply with a similar design. Head lights are shining public harmony with level A lighting, bright yellow light in the night to help with vehicle flow speed 80km/h with a set two stage 250W/150W power supply side of the canal, a set two stage 400W/250W power supply side of the living conditions and Two stage 400W/250W power supply in two separators. The head lights are arranged equally spaced with a distance of approximately 50m, is controlled by 08 control lighting cabinets two stage power modern and fit the general trend of the world. All of them are going underground cables help keep the beauty of urban landscape. 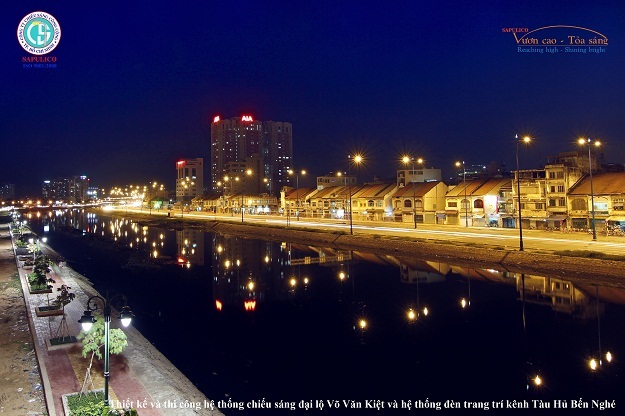 In addition, the park area under the Nguyen Tri Phuong bridge is decorated by 9 head decorative lights 4,32 m with a modern design are mounted MH 70W with white light, make a special point between routes as well as enhanced security for people walking on the park. - And more than 120,000 meters of cable types. Lighting system is magnificent on night with the lights decorating the Environmental Improvement Water Canal Project on the other side has taken this route illuminated new life.